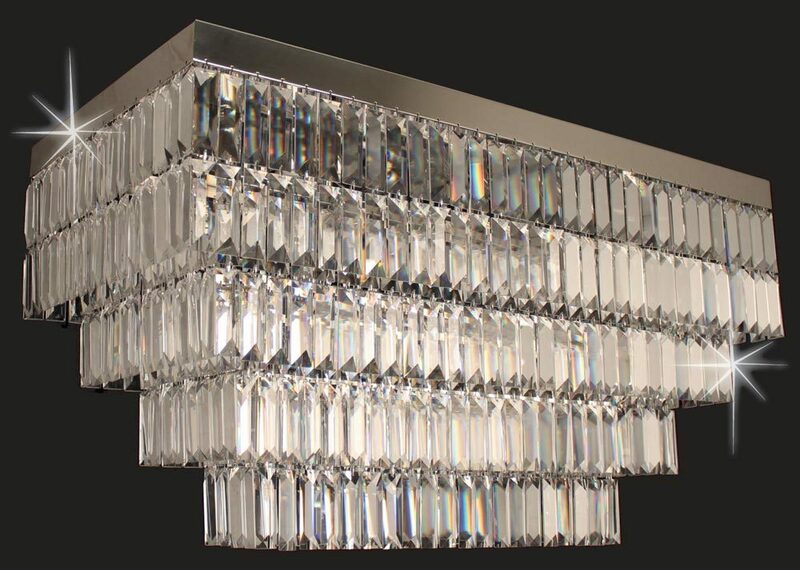 This Impex Crystal Art rectangular flush 6 light chandelier in polished chrome is magnificent and contemporary. Featuring a polished chrome ceiling mount and four sumptuous tiers of high quality elongated crystal prisms, which overlap forming a curtain of sparkling crystal that narrows towards the bottom. This bright luxurious feature centrepiece is fitted with six spot lams that will create the most wonderful effect when lit. This statement piece crystal light adds luxury to any space and is a great source of illumination. Capture the shimmering world of refracted light with the Crystal Art collection whilst adding a focal point to any room. Ideal for use over a dining table or in any large bedroom or living room. Searching for unusual lighting features to complement an ultra-modern or contemporary space can sometimes prove difficult, especially if you are looking for something with the wow factor. Well here it is and made in Britain too! Please note that this fitting must be fitted with LED lamps (not supplied) up to a maximum of 6w each. There are alternative fittings available in the Crystal Art collection that can be viewed below. Impex Lighting are one of Europe’s leading manufacturers who supply a comprehensive ranges of fittings in traditional, contemporary and classic styles like the Crystal Art rectangular flush 6 light chandelier in polished chrome featured here.